The technical, economic, and social development of the last one hundred years has created a new type of long-term contract which one may call `Complex International Contract'. Typical examples include complex civil engineering and constructions contracts as well as joint venture, shareholders, project finance, franchising, cooperation and management agreements. The dispute resolution mechanism, which normally deals with such contracts, is commercial arbitration, which has been deeply affected in recent decades by attempts to improve its capabilities. Most importantly, there is the trend towards further denationalization of arbitration with respect to the applicable substantive law. In this regard, a new generation of conflict rules no longer imposes on the arbitrators a particular method to be applied for the purpose of determining the applicable rules of law. 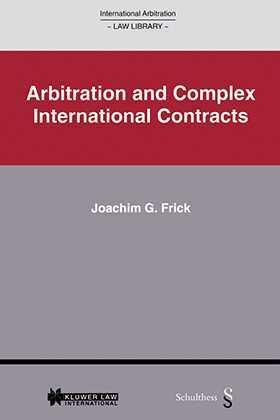 Moreover, arbitration more frequently took on the task of adapting Complex International Contracts to changed circumstances. Also, special rules have been developed for so-called multi-party arbitration and fast track arbitration facilitating efficient dispute resolution. The author describes these trends both from a practical as well as a theoretical perspective, evaluating not only the advantages, but also the risks involved with the new developments in arbitration. Relevant issues with respect to the drafting and renegotiation of such contracts are also discussed. Remedy against the arbitrators' choice of law? Facilitated adaptation of complex international contracts under a rule of lex mercatoria?